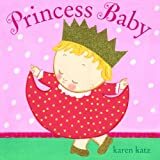 Princess Baby by Karen Katz, Schwarz & Wade, 2008. This baby does not want to called Cupcake or Little Lamb or Sweet Gumdrop. She wants to be addressed with her proper title, Princess Baby! When her parents understand, at last, all is well. Princess Baby wears sparkling gold shoes and a glittering crown. Bright patterns make up the illustrations which are influenced, no doubt by Katz's interest in textiles. The love the parents feel for their "princess" is reassuring and heart-felt as the family embraces on the final page. If you know a family with a new baby girl, this is the book for them.